A Black Country choir. 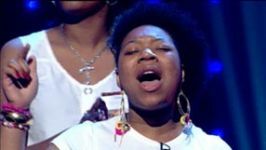 Youth gospel choir Dreemz of West Bromwich appeared in Last Choir Standing hosted by Nick Knowles and Myleene Klass. The 15-strong group, all aged between 14 and 20, The team who helped to form Dreemz say they put the choir together to give youngsters an alternative to hanging around on the streets.. The amateur choir was set up three years ago to give youngsters in the area something positive in which to take part. At the auditions, Dreemz were the only choir who hadn’t got an MD. At first Sharon couldn’t decide whether to put them through and had to send them away so she could have time to think, before eventually giving them a "yes". But it was desperate times for the choir, they needed an MD, and they needed one fast. Theresa, choir manager, had spent night and day searching for someone to take on the role, and finally she found one in Laura. Performing in front of Laura convinced her to take on the role, "I’d love to work with you if you’ll have me!" Against all odds, and only having had an MD for 7 days, Dreemz performed, "All My Life", leaving Sharon in tears saying she felt "so proud, that they’d listened and had shown so much commitment".